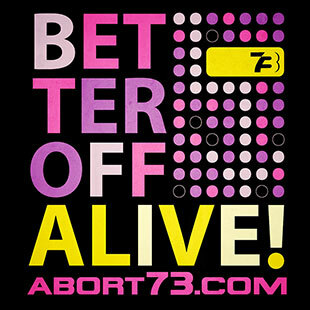 Abort73 has embraced a decidedly unconventional marketing approach as a way to get around all the stereotypes and misconceptions that surround the abortion issue. 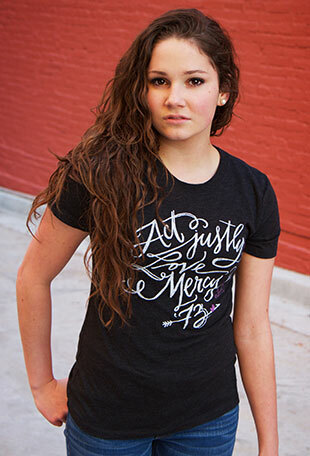 At the heart our efforts are a collection of simple but ambiguous pointers: T-shirts, bags, stickers, pens and more. All of these items can be used by individual students to great effect, but with the focused backing of an entire student group, the impact multiplies exponentially. The Abort73 Campus Blitz is a way to saturate a campus with Abort73.com for an entire week, until students can't help but check the website out. It will look a little different from campus to campus, but here's a working model. It can always be adjusted with regard to the size of the school, the size of your budget and the number of students you'll have participating. Chalk Abort73 URL and slogans on sidewalks across campus. One of the oldest and most cost-effective forms of viral marketing: a few sticks of chalk can go a LONG way on a college campus. Copy and post Abort73 downloadable flyers on campus bulletin boards. Almost as cost-effective as chalking, the Abort73 downloadable flyers are another great marketing tool. Print some masters, find a high-speed copier and go to work. Bulletin boards across campus are calling out for these – and they may need to be replenished as the week goes on. Abort73 ads or inserts run in the student newspaper and on facebook. Student groups can generally get a discounted ad rate for the student newspaper. Any of the Abort73 shirt designs can run as a newspaper ad. Paying for the insertion of Abort73 Flyers is another option. On Facebook, it's possible to create an extremely targeted and affordable ad campaign. We can set it up to only target the college-aged people in your town and since it's "pay per click", thousands of impressions are included for free. It's only the click-throughs that cost anything, and we can place the daily spending limit wherever you want it. 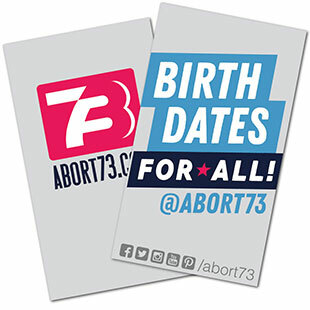 Students wear Abort73 shirts and leave a trail of promo cards behind them. Five days of Abort73 shirts criss-crossing the campus are sure to get noticed, especially when accompanied by strategically left-behind promo cards: on seats, benches and bus stops across campus. Abort73 flyers are deposited in student mailboxes and/or on car windshields. The cost and viability of these tactics will vary from campus to campus, but some schools permit student groups to deposit materials into student mailboxes for free. Abort73 pens and/or frisbees are handed out at key campus locations. After two days of cross-platform exposure to Abort73, this is a chance for students to interact with you directly. At this point, many of them may have already visited the website. There should be plenty of opportunities for dialogue and if nothing else, you'll be leaving them with Abort73-branded materials that have some intrinsic value in their own right and are much more likely to be held on to than a flyer or brochure. Table is set up in the Student Union to loop Abort73 videos and/or hand out Abort73 booklets. Put together a sequence of Abort73 videos – whichever ones you believe to be the most effective – and loop them on a TV or computer in the student union. This gives you opportunity to begin the education process for those who haven't been to the website and also provides more opportunities to dialogue about the issue and explain what you're trying to accomplish. Have some of our Life Stories booklets on hand to give away to those who are interested. As campus outreach projects go, the Abort73 Campus Blitz is very affordable, but if you're worried about how to pay for it, do some research. Campus clubs qualify for all sorts of financial assistance. You may be surprised at what's actually available to student groups who take the time to jump through the necessary hoops. This page was last updated on September 17, 2010. To cite this page in a research paper, visit: "Citing Abort73 as a Source."